For quantitative determination of HDL and LDL/VLDL cholesterol and evaluation of drug effects on HDL and LDL/VLDL metabolism. CHOLESTEROL concentrations in High-Density Lipoprotein (HDL) and Low-Density (LDL)/Very-Low-Density (VLDL) Lipoproteins are strong predictors for coronary heart disease. Functional HDL offers protection by removing cholesterol from cells and atheroma. Higher concentrations of LDL and lower concentrations of functional HDL are strongly associated with cardiovascular disease due to higher risk of atherosclerosis. The balances between high- and low-density lipoproteins are solely genetically determined, but can be changed by medications, food choices and other factors. Simple, direct and automation-ready procedures for measuring HDL and LDL/VLDL concentrations are very desirable. BioAssay Systems’ HDL and LDL/VLDL quantification kit is based on our improved PEG precipitation method in which HDL and LDL/VLDL are separated, and cholesterol concentrations are determined using a single Working Reagent that combines cholesterol ester hydrolysis, oxidation and color reaction in one step. The color intensity of the reaction product at 570nm or fluorescence intensity at λex/em = 530/585nm is directly proportional to total cholesterol concentration in the sample. Applications For quantitative determination of HDL and LDL/VLDL cholesterol and evaluation of drug effects on HDL and LDL/VLDL metabolism. 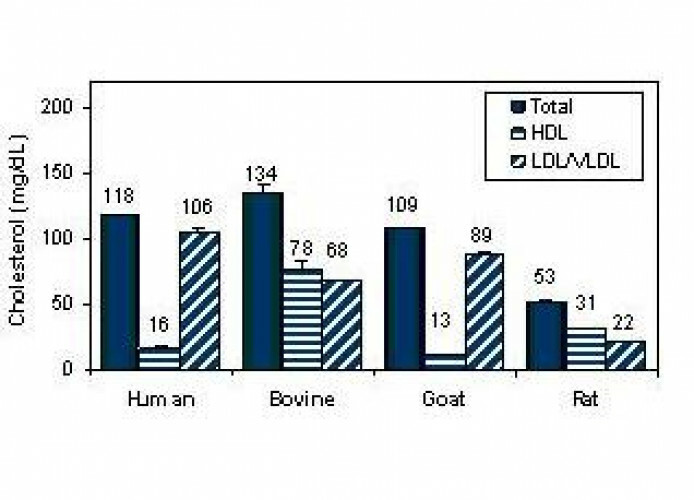 References Assay: HDL/LDL in Mouse Serum (Pubmed). 2. Wan W et al (2011). Genetic deletion of chemokine receptor Ccr6 decreases atherogenesis in ApoE-deficient mice. Circ Res. 109(4):374-381. Assay: HDL/LDL in Mouse Serum (Pubmed). 3. Bourdon JA et al (2012) Hepatic and pulmonary toxicogenomic profiles in mice intratracheally instilled with carbon black nanoparticles reveal pulmonary inflammation, acute phase response, and alterations in lipid homeostasis. Toxicol Sci 127(2):474-484. Assay: HDL/LDL in Mouse Plasma (Pubmed). 4. Tucci, S et al (2010). Medium-chain triglycerides impair lipid metabolism and induce hepatic steatosis in very long-chain acyl-CoA dehydrogenase (VLCAD)-deficient mice. Mol Genet Metab 101(1): 40-47 . Assay: HDL/LDL in Mouse blood (Pubmed). 5. Nagajyothi F et at (2011). Trypanosoma cruzi utilizes the host low density lipoprotein receptor in invasion. PLoS Negl Trop Dis. 1;5(2):e953. Assay: HDL/LDL in Mouse serum (Pubmed). 6. Uddin, MJ et al (2011). Detection of quantitative trait loci affecting serum cholesterol, LDL, HDL, and triglyceride in pigs. BMC Genetics 2011, 12:62. 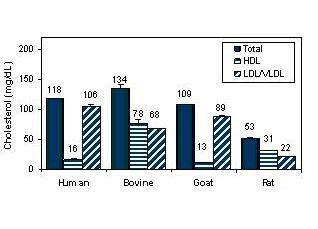 Assay: HDL/LDL in Pig Serum (Pubmed). 7. Takakuwa Y et al (2011). AC13, a C-terminal fragment of apolipoprotein A-I, is a candidate biomarker for microscopic polyangiitis. Arthritis Rheum. [Epub ahead of print]. Assay: HDL/LDL in Human blood (Pubmed). 8. Parveen, TD et al (2011). Antihyperlipidemic Activity of the Methanolic extract from the Stems of Tinospora cordifolia on Sprague dawley rats. Der Pharmacia Sinica 2 (1): 104-109. Assay: HDL/LDL in Rat blood (Pubmed). 9. Shanmugasundaram R, Selvaraj RK (2010). Dietary lutein and fish oil interact to alter atherosclerotic lesions in a Japanese quail model of atherosclerosis. J Anim Physiol Anim Nutr (Berl). [Epub ahead of print]. Assay: HDL/LDL in Bird Japanese Quail blood (Pubmed). 10. Zhu, FG et al (2010). Use of Inhibitors of Toll-like receptors in the prevention and treatment of hyperchloesterolenia and hyperlipidemia and dreases related thereto. US2010/0098685A1. Assay: HDL/LDL in Mouse blood (Pubmed). 1. Tam J et al (2010). Peripheral CB1 cannabinoid receptor blockade improves cardiometabolic risk in mouse models of obesity. J Clin Invest. 120(8):2953-66. Assay: HDL/LDL in Mouse Serum (Pubmed).